Multi-material printers are unique and innovative additive manufacturing devices. 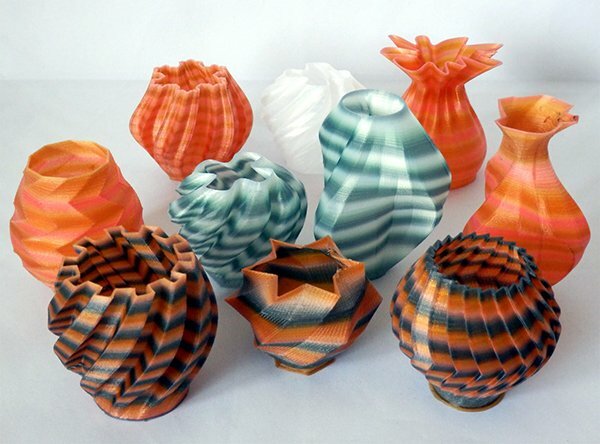 They combine multiple printing materials with different properties to produce 3d objects. This 3d printing technology allows to use over 120 printing materials within a single printing model. Modern 3d multi-material printers are able to handle different kinds of materials such as lenses, fabrics, fiber optics and even metamaterials. This is an excellent feature if you need to use up to 10 different materials simultaneously to create an object. Among the main advantages of using multi-material 3d printers are superior quality of the printed objects and excellent printing speed. When we talk about fine details, it’s high precision and a great variety of available materials. Still, is it worth buying a multi-material 3d printer? In this article, we’ll discuss major advantages and drawbacks of using these printers in an additive manufacturing industry. A set of major improvements has occurred in 3d printing technology recently. They allow additive manufacturing industry to reduce manufacturing time and costs. A wide range of materials available for printing favour a more creative approach towards object design. Multi-material printers help manufacturers to approach the world of prototypes from a completely different perspective. Now it’s possible to print using flexible, rubber-like, rigid, opaque, transparent, and composite materials. Therefore, this technology has become a game-changing innovation for designers, engineers and manufacturers. The functioning of multi-material printer resembles the principle of the traditional inkjet document printers. But, instead of dropping ink on the paper the 3D printer jets layers of liquid photopolymer material onto a build tray. Afterwards, the material is immediately cured by a UV lamp and solidified. Now, it’s ready to be built upon with successive layers. The polyjet technology also allows to print several materials simultaneously in the same part of the object. One of the most famous multi-material 3D printers is the Objet Connex series by Stratasys. It’s excellent for building precise multi-material prototypes (Objet Connex Stratasys). Multi-material printing is a highly suitable solution for product design and development. Nonetheless, is a multi-material printer worth buying? Multi-material 3d printing allows to create an object without extra actions like assembly, painting, and post-curing. Multi-material 3D printers allow to incorporate a wide range of materials in a single print job. They may vary in rigidity, color, transparency and thermal resistance. More than 100 materials and digital materials are available for object manufacturing. You can select from rigid to rubber-like, opaque to transparent and ABS-simulating performance materials. Sufficient reduction of time consumed for objects 3d printing and product development. Manufacturers are able to iterate and review the designs faster and, as a result, cut down on product’s time-to-market. Multi-material printers allow to implement your creative ideas in a highly realistic and precise manner. High accuracy while producing fine details: smoother surfaces, thinner walls etc. Faster improvements to your prototypes thanks to fine details captured in a wide range of materials and colors. It’s possible to simultaneously print multiple materials in the same part of the object. A good feature of multi-material printers is that they allow designers and engineers to work faster on their products. High accuracy and reduced 3d printing time help designers and engineers to easily figure out design and technical improvements. Subsequently, their work becomes more efficient. In other words, additive manufacturing bureaus are now capable of printing realistic prototypes that resemble the intended final product. These objects have an excellent surface finish and feature details. As a consequence, the whole manufacturing process becomes faster. Your clients will be delighted to see an accurate reproduction of their product in their hands! The number of materials available is incredibly high and it keeps growing. The wide range of materials is vital for attracting new industries and markets to the additive manufacturing world. In fact, design flaws and issues related to the choice of materials can be accurately detected and solved. Mechanical properties of the materials used for multi-material 3d printing are rather poor at the moment. Sensitivity to the influence of sunlight, humidity or ambient heat. It may cause dimensional changes and affect tolerance. You’ll have to plan multi-material and multi-color parts beforehand. Multi-material 3d printing is still developing. We need advances to combine different materials families e.g. metals and plastics in a single cycle of printing. It’s well known that multi-material printers work with UV-active photopolymers. So, exposure to ambient heat, humidity or sunlight can affect the tolerance and the durability of the materials. This may subsequently cause deterioration. Moreover, due to the nature of the manufacturing process materials have poor mechanical properties. They can handle only a limited number of functional tests. This problem is caused by the poor strength of the resins used in the polyjet printing process. So, if you need to produce highly-solid and durable objects, multi-material 3d printing might be the wrong choice. The expediency of buying a multi-material 3d printing machine largely depends on your needs. The advantages of multi-material 3d printing are undeniable. But there are some issues to consider before buying a multi-material printer. Does your additive manufacturing bureau needs a wide range of materials? Do you require a nearly absolute (±0.1mm) precision with a high surface quality? Then buying a multi-material printer is the right decision. But, if you need to test the mechanical, thermal and fireproof properties then it is better to go for a different technology, e.g. FDM technology. Multi-material 3d printing technology is effectively used for building multi-material and multi-color prototypes. It’s perfect for soft-touch components, simulated polypropylene and simulated rubber. A feature that allows combining various families of materials still needs further developments. They are currently in the early stages and might take several years of work to be implemented. Yet, the best in this technology might yet to come. HP will introduce soon a new printer that is going to rewrite the rules of 3D printing according to HP. HP describes it as a printer with a limitless potential. You can get more information here: HP multi-fusion.